Working in an office environment can be much harder physically than anyone expects. Staying in shape is difficult when you work a desk job; muscle stiffness, soreness, and strain can set in and make every day feel like a challenge. Going to the gym is one solution – but running on a treadmill or lifting weights doesn’t necessarily provide you with the flexibility and core strength you really need to sit in a desk chair for eight hours or longer each day. Pilates can make your body more tolerant of long days staring at a computer screen by increasing joint flexibility, stretching tight muscles, and relieving tension. 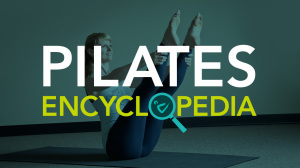 Pilates is a full body workout developed by Joseph Pilates and used by people all over the world. Anyone can do Pilates, regardless of age, athletic ability, or preferred sport. Ballet dancers do Pilates. So do ball players, runners, swimmers, celebrities, expecting moms and new moms, kids, grandparents, men, and women. Pilates focuses on strengthening your core, improving your flexibility, and increasing your range of motion. Doctors recommend Pilates for rehabilitation after injuries, coaches get their athletes on board for strength and flexibility, and seniors can use it for better focus, balance, and energy. The best thing about this kind of work-out is that you can incorporate it into your daily routine. While Pilates classes may be scheduled for only a few days per week, there are plenty of exercises you can do at home – or even at the office! For this booklet, I’ve adapted many of the floor or equipment routines into chair-based workouts, providing you with an easy and unobtrusive way to get exercise at your desk. Each movement is designed to work instantly to ease common complaints suffered by desk workers: tight shoulders, hip cramps, back strain, neck tension and more. Doing these exercises regularly also prepares your body for the more challenging routines done in the studio. Besides specifically targeting individual muscles and joints to banish pain and tension, Pilates improves your core strength, supports your spine, and can clear your mind and give you extra clarity when you do return to your work. These five exercises take only a few minutes to complete and can be performed during a break or during your lunch period. I encourage you to give them a try the next time you feel like you can’t sit at your desk a moment longer! Start by sitting with your back straight, your knees slightly apart, both feet planted on the floor, with your arms down and your palms facing your body. Raise your arms slowly out to either side of your body, rotating your wrists to turn them inward again when the arms reach overhead. Don’t worry how high your arms reach, just make sure your elbows remain completely straight throughout, especially at the top. Reverse the process to lower your arms slowly from over your head back out to your sides, and down again. Repeat 10 times. At the top of your reach, you can stretch upward a little, or lean from one side to another a little. 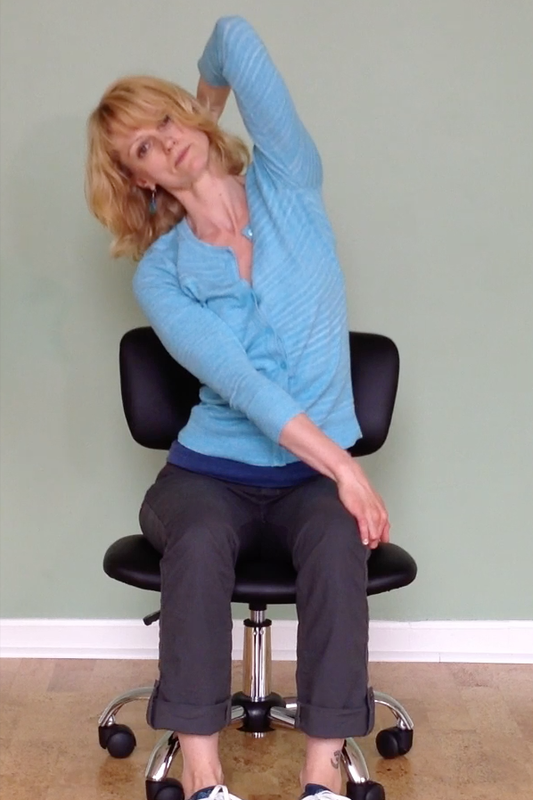 This exercise takes your shoulders through a complete range of motion and relaxes tension. Breathe! Sit straight in your chair, and reach your right arm forward and down between your knees. Turn your body slightly to the left, rotate your palm outward, thumb down, and grasp the inside of your right knee. Look to your left, and drape your back arm over the back of your chair, letting the inside of your arm curve slightly around the chair back and act as a brace. Press your right hand against your right knee to twist your midsection slightly to the left. Breathe slowly and deeply into your ribcage on the side where you feel pressure. Hold for five or ten breaths, then slowly return to a forward facing position. Next, reverse the exercise. You may hear your spine make a cracking” noise – if it doesn’t hurt, then don’t worry! You’ve simply released built-up tension. Repeat twice to each side. Sit facing forward in your chair, with your knees slightly apart and feet flat on the ground. Reach your right arm across your lap, and grasp the outside of your left thigh. Stretch your left arm straight up in the air, and slowly bend your upper body to the right, keeping your body faced forward. You may also bend your left arm at the elbow and grasp the back of your neck. Hold for five breaths. You should feel the stretch in your side, upper back and shoulder, maybe even down into the hip. If your muscles feel too tight, you may put your right arm back by your right side and brace that hand on the chair, then turn your head and upper body slightly to the right to ease the pressure. Sit straight in your chair with your buttocks at the back of the seat. Take your right ankle and bring it up and across to rest on your left knee. Grasp your right knee with your right hand, and your right foot with your left hand. Lean your body slowly forward at the waist, looking at the floor, until you feel the gentle stretch in your right buttock and outside of the right thigh. If you are very flexible, you can reach your arms forward and let them hang down in front of you, deepening the bend. You can hold this position as long as you feel comfortable, then slowly straighten, return your right foot to the floor, and repeat on the opposite side. As usual, hold the position for 5 breaths on each side for a complete stretch out. Stand to face the seat of your chair. (If your chair rolls or swivels, practice with a stationary chair at first.) Lean forward and brace both of your forearms on the seat of the chair, with your hands clasped and your weight on your elbows. Step back with one foot until you are in “lunge” position. Step the other foot back so you are in a modified plank position. Keep your legs stiff and your buttocks slightly raised. Lower your hips slightly, just enough that you feel the slight pull in your abdominals, then lift back up. Don’t allow your hips to sag, or you will strain your back muscles. After 5-10 hip lowers and lifts, walk your feet back up to the chair and straighten slowly. This strengthens your core and leaves you feeling energized. You can watch a video of the routine on our YouTube channel. Please consider sharing this with your co-workers, family, and friends. You can download the article here. We welcome visitors to our studio, so feel free to come by and check out a class at any time! “Real” Pilates at Concord Pilates studio isn’t much harder than these easy exercises, so don’t think “I can’t do it” or “I’m not in good enough shape.” We won’t tear you down – we’ll build you up! Our motto is simply “Move better, live better”.